The Complete Detail Kit is the "Best-of-DWG". Give your car the attention that it deserves! 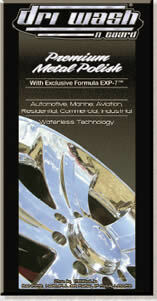 This hi-tech package sets the industry standard for "Vehicle Appearance". 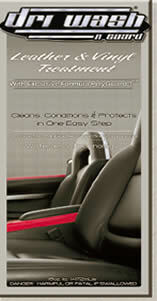 Here is everything you need to give your vehicle the ultimate cleaning, polishing and protection. Just add TLC! Your care will look the best ever. DWG All-Weather Tire & Trim Treatment is the easy way to bring back the rich look of brand-new tires. Grip the handy trigger, spray a rubber surface, then rub it off. Dirt, grime, and oil are wiped away, leaving a surface that is cleaned, conditioned, and protected. DWG All-Weather Tire & Trim Treatment contains the exclusive formula PolyGuard-4™ which revitalizes the appearance of rubber and plastic, by creating a polymeric emulsion that lifts dirt and whisks it away. The result is a surface that looks new and natural, not glossy or artificial. 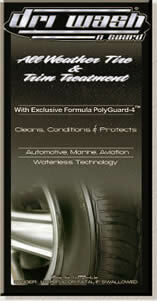 DWG Oil Treatment with our exclusive PolyGuard-1™ does it all! This unique, highly concentrated conditioner improves the natural lubricating qualities of motor oil. 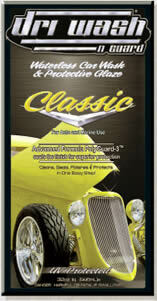 Unlike most oil additives, DWG PolyGuard-1™ Oil Treatment does not merely coat the inside of the engine. Instead it bonds with the motor oil, increasing the film strength of the oil itself, and dramatically improving the oil stability to create a protective barrier between moving engine components. 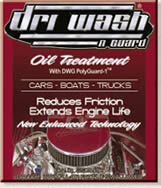 DWG Oil Treatment enhances your motor oil providing superior protection for your engine! Six Pack - Enough product to last one year for one automobile. Don’t repaint that old vehicle! Restore the shine on older, dull painted surfaces with OxyGone.™ Quick. Easy. Inexpensive. OxyGone™ gets rid of oxidation that dulls painted surfaces and removes feather scratches from the surface of your vehicle.. All it takes is a quick polish, a light rub to a haze, then buffing with a terry towel, and the shine that you didn’t know was there is back again! Reverses the damaging effects of sun, wind, and precipitation. No prewashing necessary. Contains no ammonia. We’ve got the One-Two Punch for dull painted surfaces: bring back the shine with OxyGone,™ and keep that shine with DWG for the Car. Save that paint job! OxyGone™ makes old, faded painted finishes look showroom new! Bring leather and vinyl back to life with DWG Leather & Vinyl Treatment! DWG Leather & Vinyl Treatment with exclusive formula PolyGuard-5™ cleans, conditions, and protects the widest variety of leather and vinyl goods adding life and beauty to them — without a drop of water! An easy spray, a quick wipe and dirt, grime, and age seem to melt away! Just spray and wipe and the dirt disappears, leaving a conditioned and protected surface that resists dirt! DWG Upholstery, Fabric & Carpet Treatment cleans, deodorizes, and removes stains, while protecting upholstery, fabric, and carpet without a drop of water! It’s the perfect companion for DWG for the Car and for the Home! Set-in stains, stubborn odors, and resistant spots are no match for the power of our exclusive PolyGuard-5™ formula. Natural ingredients and innovative cleaning technology combine to make short work of both stains and odors. It’s safe to use on nearly all kinds of upholstery, fabric and carpets and leaves no residue to attract more dirt. It contains no petroleum distillates, is non-corrosive, and is biodegradable. 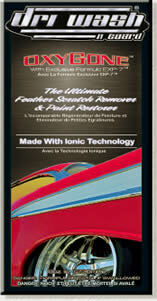 For use with ULTA-IONand CLASSIC Car product. 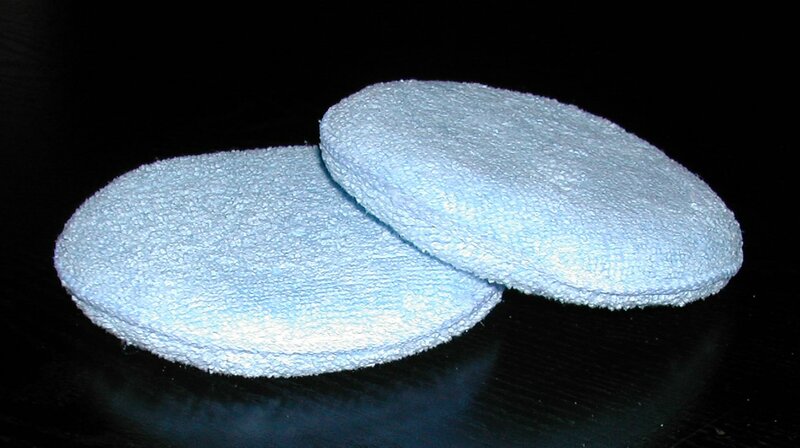 *Machine washable, no fabric softeners, air dry if possible or use low heat setting on dryer.